← All American Hamburger – First McDowell’s, now McShimmel’s? 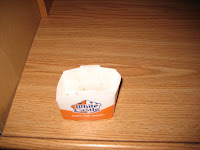 More than 80 years ago, White Castle started serving up melt-in-your mouth sliders to Americans as the first fast-food hamburger chain ever. Today people still Crave them and to prove it, we ate more than 500,000,000 in 2008!! (It’s true.) In fact, according to them, “First industrial-strength spatula. First mass-produced paper hat. First to sell a million hamburgers. First to sell a billion hamburgers. 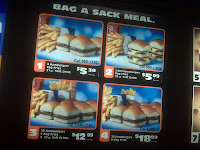 First frozen fast food for sale.” And according to me, the first burger I call out for after a few adult beverages!! That’s exactly what happened this night. On our way back from an awesome Shadows Fall show and Burger Conquest on Long Island, Jackie, Tim and I decided to feed the crave. 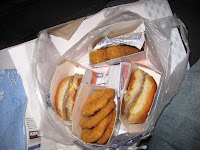 White Castle’s – hamburger’s answer to heroine. 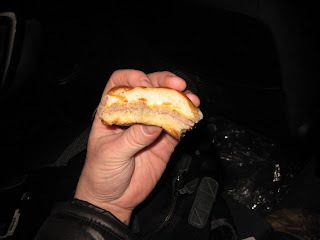 This entry was posted in Burgers, Hamburgers, New York, Sliders and tagged best burger, burger conquest, cheese, ciancio, crave, french fries, hamburger, nyc, rev, review, sliders, white castle. Bookmark the permalink.